We made another trip to The Retirement Home this week -- that's the endearing term I'm giving our new house that's under construction. Now that the framing is complete and they are starting to install the mechanicals (as our Field Manager phrased it), we'll be making more frequent trips to check on things. We also have acquired a storage locker in NewTown where we are gradually bringing down stuff we don't want to entrust to the moving company. Beloved built some frames to keep things off the floor, just in case there were to be a hard driving rain to push water under the door. Although upon closer inspection yesterday, it seems that would be unlikely due to the good lip (step) up from the pavement outside the locker. But I will show you our front door, which we saw for the very first time on yesterday's trip, leaning against a wall on our back porch (for now). It will be painted red. I just love it! Although it's glass you can't see through it. Changing the subject now, here is a fun toy we bought earlier this week. 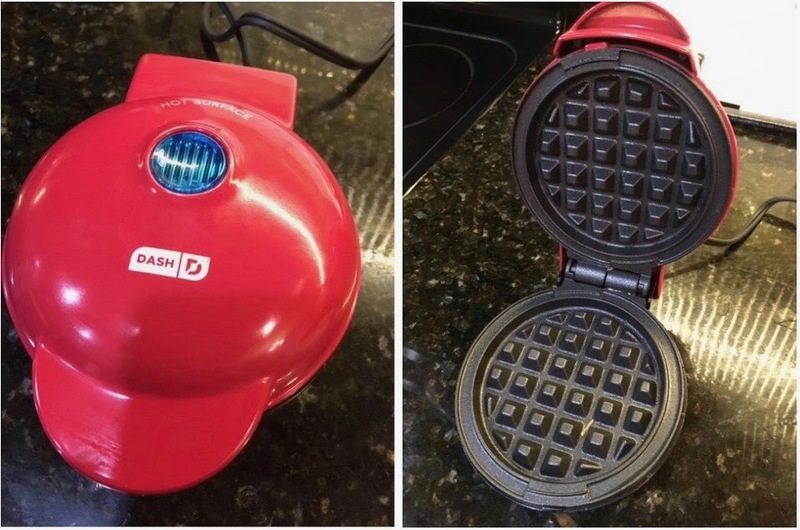 It's a 4-inch diameter waffle iron. Since I eat gluten free most of the time, I am using this little toy to make not only a waffle for my breakfast, but also to use the waffles for my hamburger bun, or for a sandwich. I don't like store-bought gluten-free bread because it tastes like wallpaper paste, tends to get tough very easily, and just doesn't stay fresh for long at all. This little gem is helping me out with that problem. I did the math to reduce the recipe I have used for years to make waffles in my big waffle iron so I can now make 2 very small waffles. Works great! Something else that has intrigued me of late is this collection of cross stitch by Vonna Pfeiffer of The Twisted Stitcher. I would absolutely love to make some projects similar to these over the next year. However, I have some things to learn before I can achieve this kind of perfection. Do you remember my problems with the Estonian Snowflake a couple of weeks ago? I got so frustrated with it after I had to correct one mistake after another. I decided to just set it aside for a while. In the meantime, my friend Karen S. suggested I transform the design from a snowflake to more of a star, like the Christmas Star. Bless her creative imagination! I was thrilled. Only a few stitches added to the big mistake area and it was done! This was added to my stack of accumulated cross stitch projects that will be framed or finished in other ways later, after my new sewing room is unpacked and put in order. 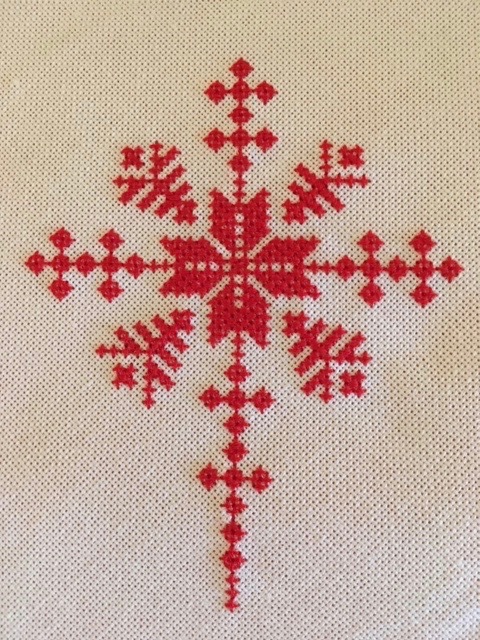 With the snowflake-turned star done, I turned my attention to yet another pattern centered around joy. Whimsical and fun, this came together very quickly on 18 count Aida using 2 strands of floss. 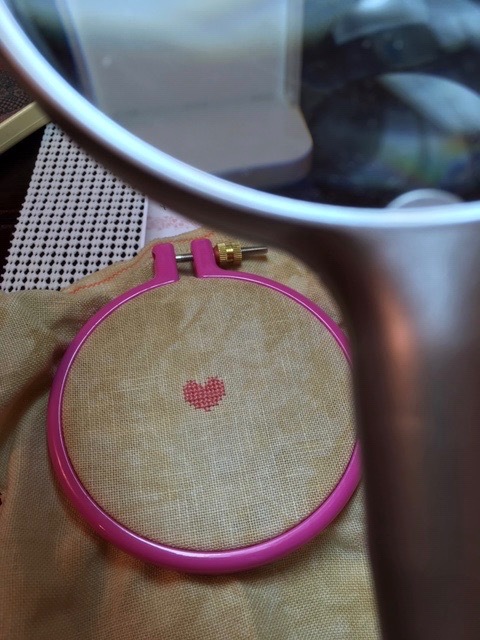 Of course, as I listen to my 'friends' on Flosstube and blog with stitching friends, I have wanted to venture away from Aida cloth to linen, which means much tinier stitches and magnification tools. 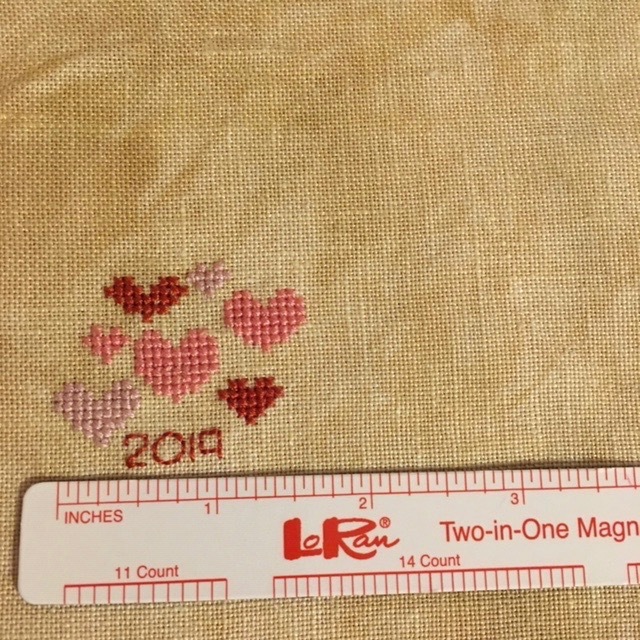 I wanted to try stitching on 40 count linen but all I could find was 32 count and that turned out to be small enough!! It is hand-dyed Doubloon. I was able to buy just a remnant cut to 7 inches by 18 inches for under $5. This was perfect for my first attempt, my effort to see if I could stitch on something so small and fine, AND would I enjoy it??? 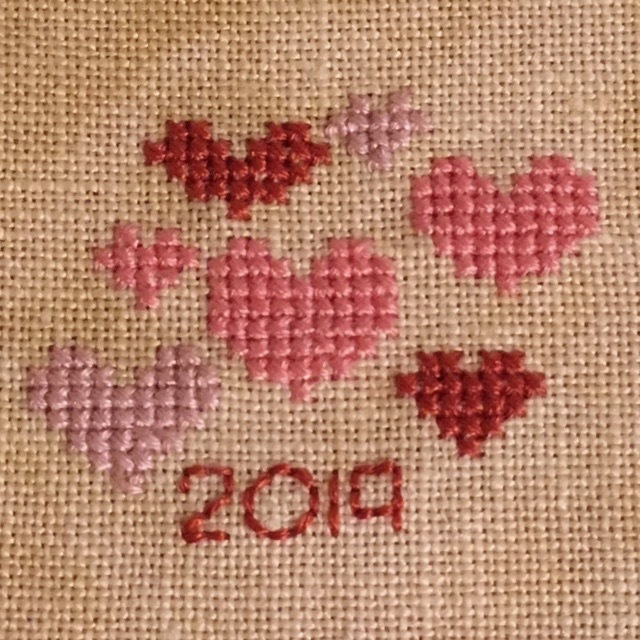 I chose a simple heart pattern that I designed myself, not wanting to commit myself to anything more involved because I was pretty apprehensive. I am pleased to say I could do it and I like how it turned out. I used two different magnifying tools, a strong sewing lamp (Ott brand) and removed stitches several times when I realized I had gone over three threads instead of two, or sewn over just one. With the arthritis in my neck, the intensive bending over my work to try to see has left me with a 'pain in the neck', something I feared might happen. Not to worry. A good night's sleep with my buckwheat-filled neck pillow and possibly a couple of Advil will get me back to normal by morning. But with that said, the small linen stitching kinda took the fun out of it for me. I think I'll go back to 18 count and be content with that. This sums up my first three days of the New Year. 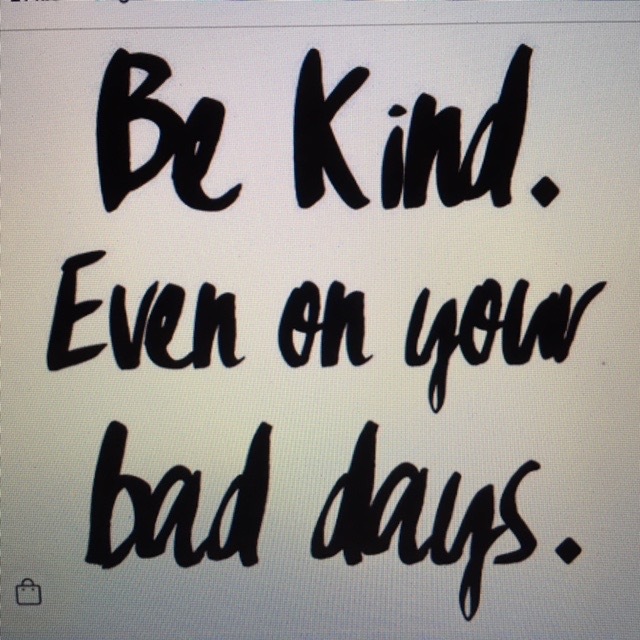 It's been fun thus far, but we all know both good and bad days make up the year. I pray with the Puritan, "May I view all things in the mirror of eternity." While some are called to do mighty works that preach truth to crowds, many more of us are expected to carry on the dailyness of life with a cheerful disposition, encouraging as many along the way as we can to put their trust in God to make sense of our lives. I tried 40 count and it was no fun at all! So my top count is 32 and that is good enough for me. Being a Prairie Schooler lover, I tend to use Aida for their charts. I think Prairie Schooler was made for Aida. We have a door similar to yours. Mine is painted Peacock by Sherwin Williams. I have moved 30 times and love living in Indy In the city! I love the small projects and that is all I will focus on this year. Can't wait to see your new home....love that front door. Storage is a problem here. We miss basements AND storage sheds! lol But the weather is glorious right now so I won't complain! I'm off to hike in a bit! Hugs! 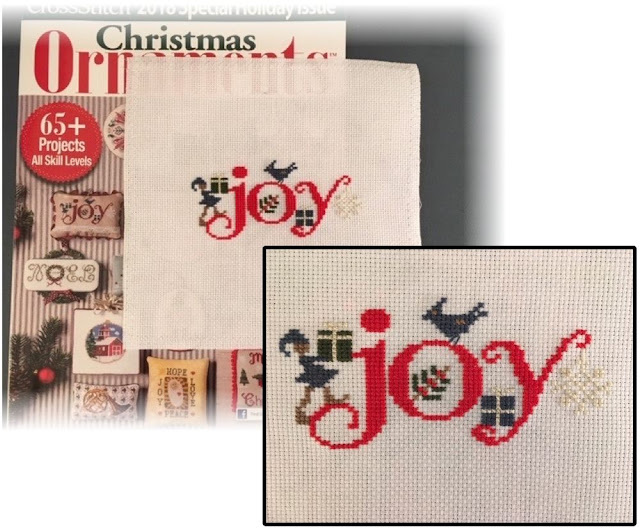 I loved reading about your cross stitch projects. It must be time consuming, but the finished products are lovely. It is also good to see how the new house is coming along. God bless you! 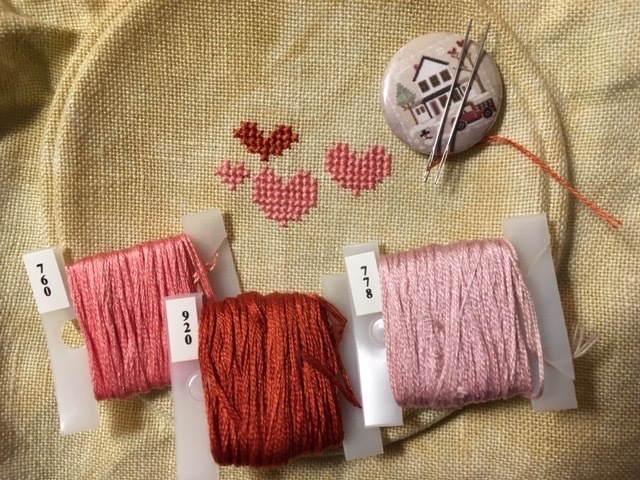 What a sweet stitch you created with the hearts for your first effort on linen! If you are still interested in stitching "over two", you might want to try 28 count in jobelan or lugana fabrics. Their threads are the same without the slubs (thin/thick) of linen. It looks like they have made good progress on your new home. I love your last lines. So true! I started on 28 count linen and to be quite truthful it is my absolute favorite number. I have a few things going with other counts, but when I am done most of mine will be there unless it is a Christmas ornament that I am trying to make smaller. 32 count is also a bit easier. With 40 I have to have the magnifier and some big reading glasses. I noticed Robin suggested Laguna..I agree with that. The weave is a bit more open but very soft though. I also love gluten free waffles. I buy a mix from Thrive Market. They had it once at Publix. I use coconut oil and almond milk instead of the called for items and I love them! A big treat with maple syrup. 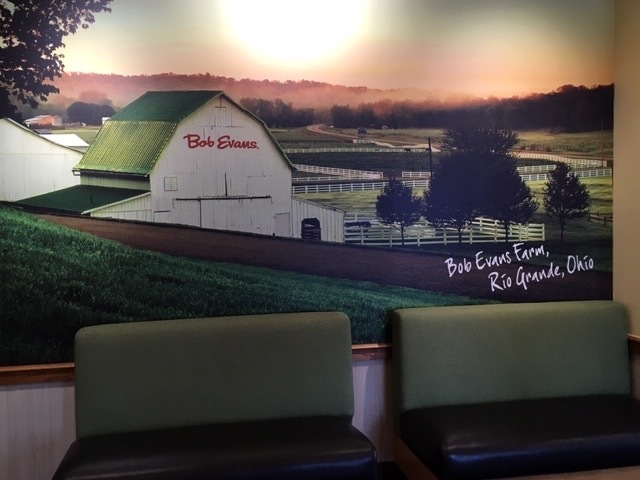 Joe and I went to Lakeland's Bob Evans many times when it first opened, then for some reason he got tired of it and won't even give going back a second thought. 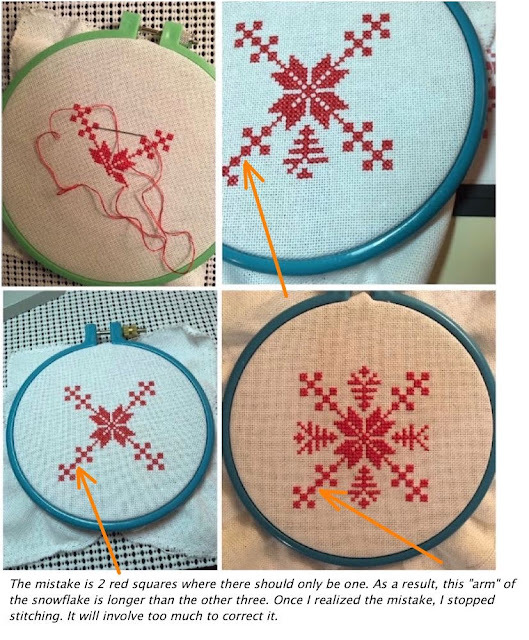 Your stitching creations always look perfect to me and your friend gave you the perfect fix for that snowflake star! Joe and I had a small storage locker for awhile until I realized how high the ceiling was in our shed. We had a loft built up there and it is perfect for our Christmas decoration bins, beach chairs, and our beach canopy. Is there room for a loft storage in your new garage? It won't get quite as hot as the attic space. Just a thought. 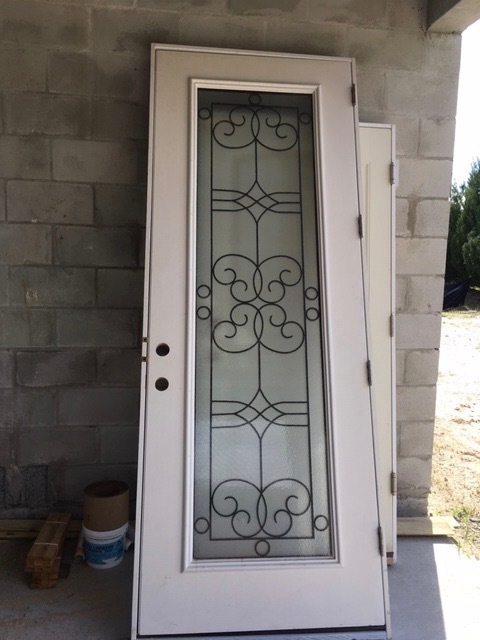 Your new front door is beautiful! I can't wait until you are a closer neighbor!! We often meet some of our friends who are winter visitors from Ohio at the Bob Evans in Silver Springs (east of Ocala) on route 40, across from the Walmart. 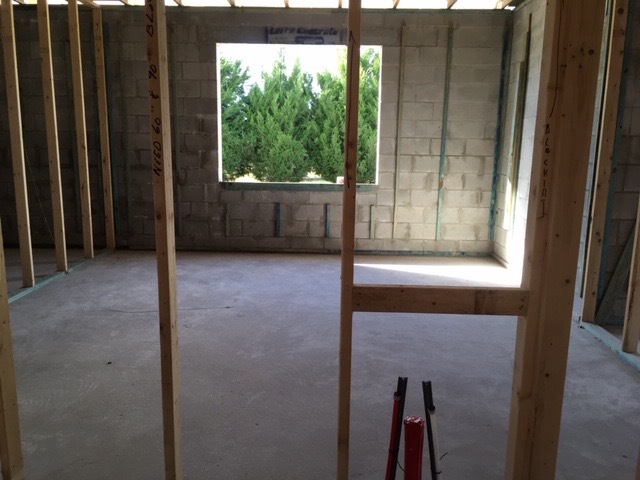 Love that your house is starting to really take shape. Love also that you have a view of some cedar trees from your bedroom window. I need trees to look at to keep me at "peace". LOL. Love what you did with the snowflake turned star. Great idea. Also smart that you have a storage locker near your new home. Good idea there too. Yes, little by little you are making the transition. 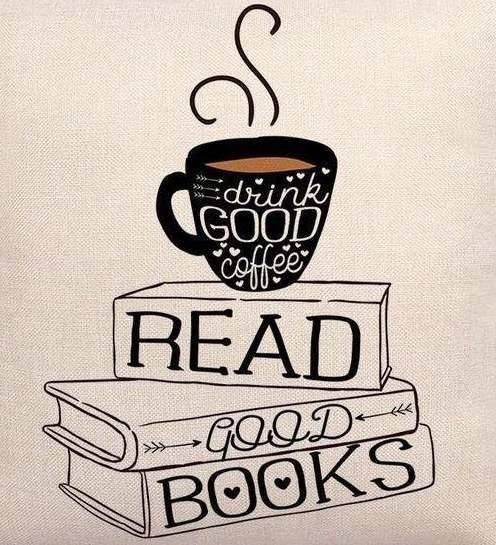 It won't be long before you will be there for good! So happy for you. Wish we were making such progress here...but so far nothing is happening. 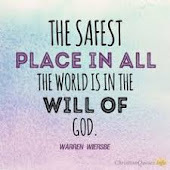 Beginning to wonder if we've missed the plan somehow...God knows...and He will take care of it in His time. Oh, I love your front door also! That is a beauty!!! Red! I love red doors. We had one on a house that we built a few years ago. I loved it. Have fun!! Enjoy your waffles! Hi Barbara--Happy and Healthy New Year! I am so excited to see your new home in progress. 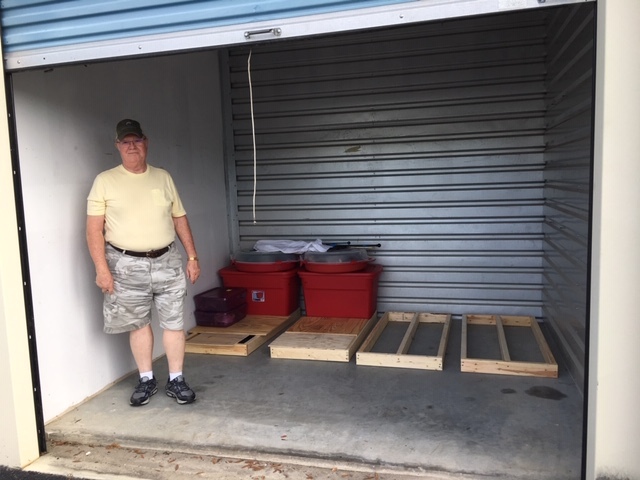 You and Tom are moving pros, so I'm sure you will have everything organized and all will go smoothly when the times comes. Can anyone ever have enough storage? We have one car and a three car garage that is filled to the brim. We moved our Christmas decorations out to the third garage this year so that we don't have to deal with carrying them up stairs. Both our backs were sore this year from doing that, so we hope the garage solution works. We know that one day we will most likely have to downsize from our house, but hope to live in it at least 10 more years before that happens. We have friends from NY who now live in Castle Rock, CO, as their first grandchild was born there last year and they made the move to e closer. That area is booming with new construction! Your cross stitch works are very pretty. I used to do cross stitch, embroidery crewel work and needlepoint when I was younger. I just don't have the eyesight to do that much any longer. Your Ott magnifier looked like that would help. 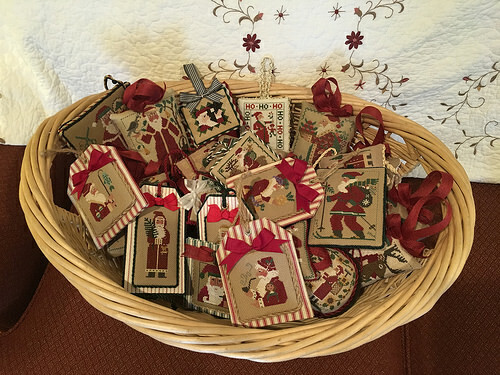 Making embroidered mini ornaments sounds like a wonderful idea. Wishing you a very happy and healthy year ahead! Wonderful stitching. Rain flooding or not it is good to store boxes up off cement. Great idea. Your stitching is very pretty! Looks like 2019 is starting well for you! Your hubby is still smart to make those lifts...keeps things from getting damp on the concrete floor that can happen with or without rain...at least here. I’d love to have something like them. Getting more exciting every week with your move. Nice front door and beautiful cross-stitch.